The Private Reserve Ink brand of pen refills made by SCHMIDT are not only popular because of the way they look and write but also because of the fact that they are completely customized and truly unique. It also has to do with what is inside the pen refill that makes it perform the way that it does! 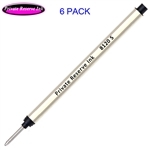 Perhaps the most widely-used pen refills are Private Reserve pen refills. The two main types of Private Reserve pen refills made by Schmidt, we offer are for Rollerball pens and Parker style Ballpoint pens. Private Reserve Schmidt 8120 Capless Rollerball refill Broad tip. Long roller ball refill by Schmidt. Schmidt Capless System is newly developed for the most smooth and elegant writing. This system combines the individual writing character of a fountain pen with the problem-free handling comfort of a ball pen. · A cover cap is not necessary for the Capless System. · The new type of ink dries immediately on the paper, but not in the system for more than one year! · Metal tube with tampon system, stainless steel tip with 1.0 mm ruby ball. · One year cap-off time. · Private Reserve 8120 black ink Broad tip capless rollerball Refill. · Private Reserve 8120 blue ink Broad tip capless rollerball Refill. Lanier Pens is your source for all Private Reserve Pen refills including the popular Private Reserve 8120 Capless Rollerball Refill.